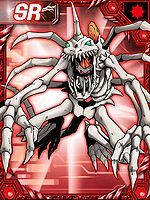 A Skeleton Digimon whose whole body has become nothing but bones. 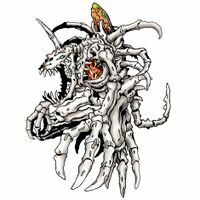 It was a Digimon that put too much importance on fighting, and as a result of its combat instinct it clung to life despite its body rotting away, becoming Skull Greymon. 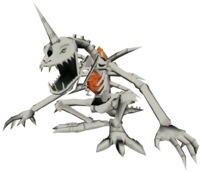 As Skull Greymon doesn't have even a scrap of intelligence to balance its combat instinct, its existence is a threat to other Digimon. Its Special Move is an organic missile launched from its spinal cord (Ground Zero). Recent studies have shown that this has evolved as "Oblivion Bird", in which a tracking function has been newly added, and both its power and range have been significantly upgraded. — Digimon Adventure: "Dark Evolution! 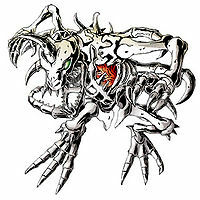 Skull Greymon"
A Skeleton Digimon whose whole body has become nothing but bones. 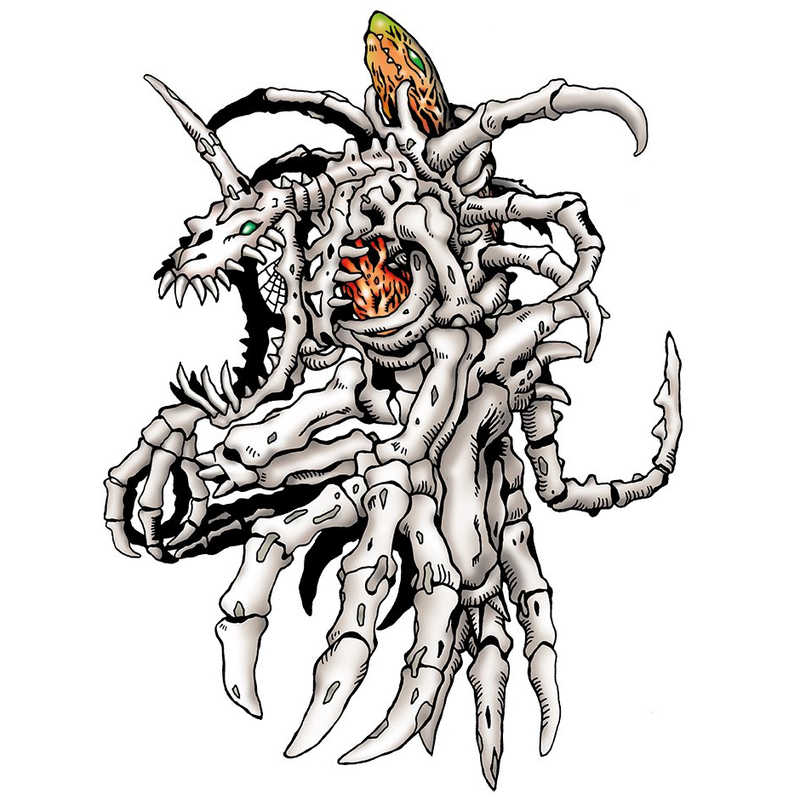 It was a Digimon that put too much importance on fighting, and as a result of its combat instinct it clung to life despite its body rotting away, becoming Skull Greymon. 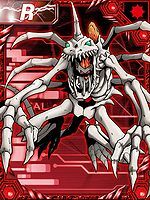 As Skull Greymon doesn't have even a scrap of intelligence to balance its combat instinct, its existence is a threat to other Digimon. 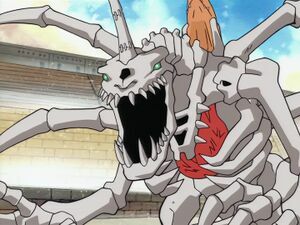 A Skeleton Digimon whose whole body has become nothing but bones. It was a Digimon that put too much importance on fighting, and as a result of its combat instinct it clung to life despite its body rotting away, becoming Skull Greymon. 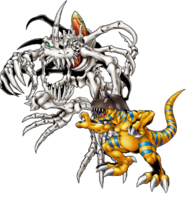 As Skull Greymon doesn't have even a scrap of intelligence to balance its combat instinct, its existence is a threat to other Digimon. Its Special Move is an organic missile launched from its spinal cord (Ground Zero). | Grey From grey (「グレイ」 Gurei), meaning old or ancient. Anime/Manga Digimon Adventure: "Dark Evolution! 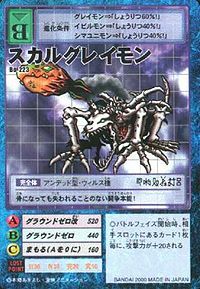 Skull Greymon"
グラウンド・ゼロ Guraundo Zero Dark Shot/Flame Rockets Shoots an organic missile from its spinal cord. Ground Zero Kai  Ground Zero Revision グラウンド・ゼロ改 Guraundo Zero Kai Dark Shot II Rotates its entire head to covert itself into a missile silo before launching a stronger organic missile. カースブレス Kāsu Buresu Cursed Breath/Buffalo Breathe Exhales a purple or green breath from its mouth that paralyzes an opponent. Fires a missile that causes a toxic explosion. Attacks with its bone claws. Due to Taichi trying to force Agumon to Super Evolve, by stuffing him full of food and then rushing into Etemon's Greymon, recklessly endangering himself, his own Greymon Dark Evolved into Skull Greymon, rampaging mindlessly. After he ran out of energy, he devolved into Koromon. When the Digimon Kaiser used an Evil Ring on Agumon and tried to force him to evolve into Metal Greymon he again evolved into this form. The Evil Ring could not control him and he ran wild attacking everything in his path. 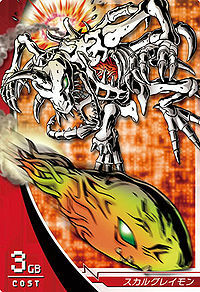 A Skull Greymon was among the many Digimon seen through the rip in the sky during Vikaralamon's rampage. 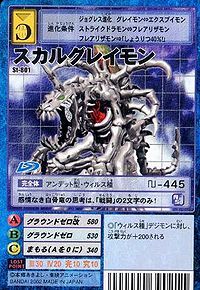 Skull Greymon was a servant of Skull Knightmon. After being defeated by Metal Greymon he was forced into a DigiXros with Dark Knightmon evolving into Super Dark Knightmon. 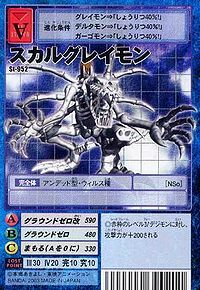 Skull Greymon appears as an obtainable Perfect-level Virus type Digimon in Digimon World. Skull Greymon serves as the main boss of the Dark Lord Mansion. After you saved Vamdemon from starving for the first time in the Dark Lord Mansion, Vamdemon will thank you and explain that its working on an experiment and doesn't give further details. Once you have recruited Shellmon and Angemon, they might tell you that Vamdemon suddenly disappeared since nobody knows where it went, so the player must go back to Dark Lord Mansion and enter the door that was sealed before, as the seal will break away, revealing a path that leads to another one of Vamdemon's secret laboratory. The Player will discover that Vamdemon, along with Bakemon were kidnapped and held in a cage by Skull Greymon, and the Player has to battle against it. Once its defeated, Vamdemon and Bakemon will be released, thanking you and giving you further information about that to get Skull Greymon was originally a Metal Greymon that Death Evolved into Skull Greymon and went on a rampage. Skull Greymon also joins the Village of Beginnings but strangely its nowhere to be seen, although you'll unlock Skull Greymon, along with Vamdemon as possible opponents in Greymon's Battle Arena. Bonus conditions: Battle more than 40 times and have at least 45 different techniques mastered. 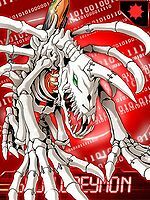 Skull Greymon's Digivolution item is the Fatal Bone which lets any Adult Digimon evolve into Skull Greymon. 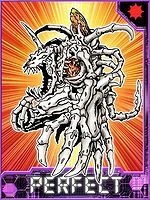 Additionally, both Metal Greymon and Megadramon are one of the few Perfect Digimon that can evolve, in this case they can evolve into Skull Greymon via Death Evolution, in where it must lose a battle, though this only has a 10% chance of happening so its reccomended to save before trying it. Evolves from Greymon with 9+ DP. Evolves to Mugendramon with 0+ DP. 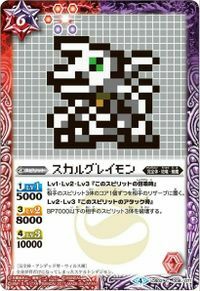 Skull Greymon appears as an opponent and an obtainable Black Card. An offshoot evolution of Greymon with enough Dark Tolerance. Can evolve to Black War Greymon once mastered. Skull Greymon appears as a boss. 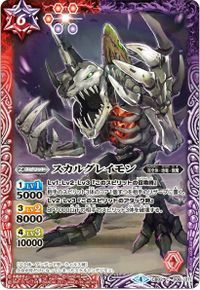 Skull Greymon is an obtainable evolution from Greymon. Can evolve in Black War Greymon. 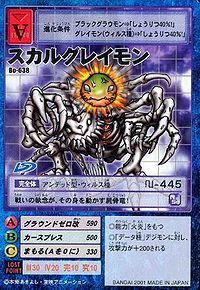 Appears as a boss Digimon at Chrome Mine, but is not obtainable or evolved from any Digimon; although it reversal evolved from Mugendramon by using researcher Phil's Revolve Chip. Evolves from Ankylomon, Growmon, Greymon, Tyranomon, Devidramon, Tortamon or Monochromon. Can evolve to Skull Mammon. Can evolve from Kabuterimon, Angemon or Birdramon. Even though it's nothing but bones, it still fights on! The only word in this emotionless, white-boned dragon's thoughts is 'battle'! Even though it's just bones, it hasn't lost its fighting instinct! This corpse bone dragon's body is able to move due to its tenacity for battle! 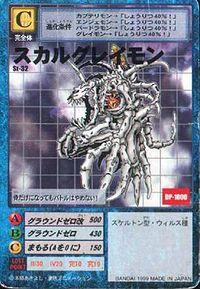 A menacing Digimon that focused solely on battle, such that even after becoming nothing but bones, it continues to fight due to the combat instinct that remains. Its absence of intelligence causes it to pick fights indiscriminately, and so it is feared by other Digimon. 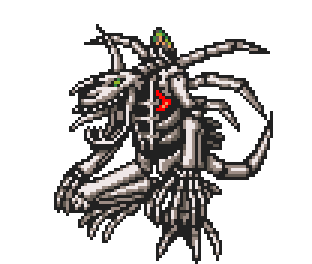 A Skeleton Digimon whose whole body has become nothing but bones. ↑ Digimon Adventure 02: "The Evil Ring's Magic Runs Wild"
This page was last modified on 6 April 2019, at 08:03.